Boynton has published dozens of books that have sold millions of copies, all featuring her hand-drawn animal characters—hippos and cows and chickens and dogs and mice, creatures that she first created for a massively successful line of greeting cards. “A to Z,” “Barnyard Dance,” “The Going to Bed Book,” “Moo Baa La La La”—they are titles whose very mention will draw out tender, fragile memories from kids and parents everywhere. These books are written so simply, for children so young—“A cow says moo. A sheep says baa”—that it’s hard to imagine that they could have hidden depths. But I have begun to realize, perhaps belatedly, that they do. “But Not the Hippopotamus” invites two obvious interpretations. First, that the hippopotamus is bashful, unsure how to insert herself into the delights of her peers. Finally, they notice and invite her in—a model for humans and armadillos alike. Second, that the other animals are deliberately excluding the hippopotamus, perhaps even just for being a hippopotamus. When read this way, the final invitation to “come join the lot of us” is bittersweet—are the moose and bear and cat and rats just leading her on? Is the armadillo wise to steer clear of these savages? 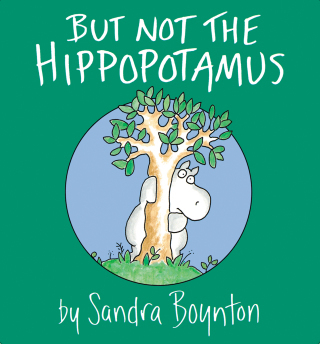 via The Hidden Depths of Sandra Boynton’s Board Books – The New Yorker.